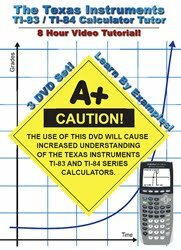 Since I have one headed into Pre-Algebra and another obsessed with all things calculator I was thrilled to be chosen to review these DVD's. We hadn't officially started school when we got these so our viewing was here and there. Math Tutor - Pre-Algebra Tutor Volume 1 is available for $26.99 here. Math Tutor - The Texas Instruments TI-83/TI-84 Calculator Tutor is the same price and available here. The Math Tutor website is very easy to navigate. They have sample videos and a full listing of what is on each DVD. Their product line covers Basic Math through Calculus, Physics and Probability and Statistics. 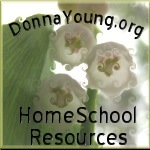 The site also offers worksheets for Basic Math, Algebra 1 and Algebra II. My oldest really loved the Pre-Algebra Vol I. Jason, the instructor, has a pleasant voice and engaged him easily. (This is a tough thing to accomplish) My oldest was riveted to the first section - even though it was about an hour in length. I liked the way Jason explained concepts and that there was no special text to buy in order to use these DVD's. Though my oldest isn't quite at Pre-Algebra level yet he got a lot out of this DVD and we will be using it in the future. Pre-Algebra Tutor Volume 1 consists of two DVD's - about 5 hours in length total. Disc 1 covers Real Numbers, The Number Line, Greater Than, Less Than, Equal To, Absolute Value, Adding Integers and Subtracting Integers. Disc 2 covers Multiplying and Dividing Integers, Powers and Exponents and Order of Operations. Given the fact that my son asks to watch more of this DVD daily and retains so much of what he learned we will be using this series to supplement his math studies in the future. Even though none of my children are at the level for The Texas Instruments TI-83/TI-84 Calculator DVD I did let my calculator obsessed 8 year old watch part of this DVD. He now wants one of these calculators for Christmas. Since he's the child who knows square roots already he'll get one. Then he can watch the rest of the DVD. We do not have a calculator of this type but when we do get one I am sure - based on our viewing - that we will be able to use it and get the full use of it. This set is 3 DVD's with 37 sections covering all of the functions of this type of calculator. A full list of the topics covered can be found here. I highly recommend both of these products. They are especially helpful to someone like me - who is not math oriented but has at least two kids that are very math oriented. Also if you entered my drawing for the Pizza party unit - leave me your email address in the cocomments so I can notify the winner. Sorry - this is my first give away. 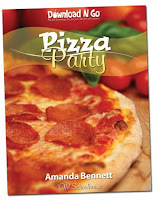 Pizza Party is one of the many great Download n' Go Units by Amanda Bennett. You can purchase the e-book for $7.95 in The Old Schoolhouse Store or at the Download n' Go Store. Boy did we love this one! With a pizza shop right down the road we have pizza quite often and it was easy to interest the boys into studying the hows and wheres and whys about Pizzas. Day 1: What is Pizza? I have three boys. The responses were pretty much what one would expect. Oldest: The best food in the world. Needless to say we learned a lot more about what is Pizza than that! I really wanted us to make a pizza but it's been so hot here that the oven is on hiatus until at least October. The boys liked learning about Italy - especially after I explained that the Super Mario Brothers had Italian names. We learned more about Italy and I loved that we could study an artist - Leonardo DiVinci and Italian Cooking music. We looked at the Mona Lisa and The Last Supper. The boys all were interested in The Last Supper as Dad was in our church's Easter program where the men did a live action portrayal of the painting. We listened to some of the works of the Italian composer Vivaldi. The oldest was interested - he's the musical guy - but the others were not. Day 4 was about The Science of Pizza. The middle boy is very into astronomy and was happy to learn more about Gallieo. We talked about yeast and unleavened bread and discussed some verses relating yeast in the Bible. We ended the week by having a pizza celebration. We played a game on my Ipod touch - Pizza Math - which uses pizzas to cover fractions. We had Little Cesar's for dinner and watched the video links included in the lesson. So far, this was my favorite and I'm sure it was the boy's favorite Download n' Go. Tying learning in with one of their favorite foods was a sure winner. 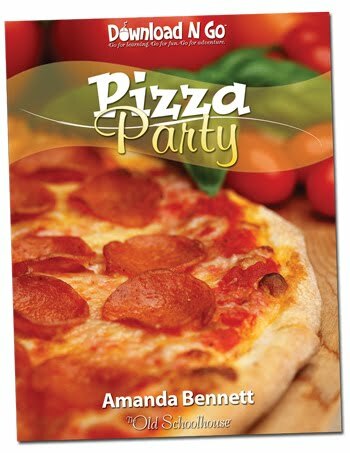 You can read more reviews of Pizza Party here and you can also enter to win a free download of Pizza Party by leaving me a comment, 'liking' Download n' Go on Facebook, following Download n' Go on Twitter or do all three for even more chances to win. Just let me know how many of those you did in your comment. I'll draw winners on Tuesday! Disclaimer: I was provided this product free of charge in exchange for my honest opinion. I received no other compensation for this review. Please remember all families are different and your results may vary. We used Vantage Learning's My Access! Home Edition for a month in order to review the product for TOS Review Crew. Available for $99 for a 12 month subscription for up to 3 students or 6 students for $129.95, this is a guided writing program. The site includes a demonstration video as well as a parent manual and student manual. The program is for ages 8 - 18 and the assignments are broken up into age ranges - 8-10, 11-14, and 15-18. My children are reluctant writers to put it very mildly. I knew that getting them to use this would not be easy - we hadn't 'officially' started school yet and they have a horrible time with fleshing out a topic. Registering and setting up the accounts was very easy. The site is easy to navigate and it is very easy to find help if needed. I set up the oldest easily. The format is engaging and easy to navigate. The student is in training to become a reporter. In order to do this the student must learn the steps in the writing process and the grading rubric that is used with My Access!. Each step is re-enforced with a short quiz to make sure the student is comprehending the lesson. 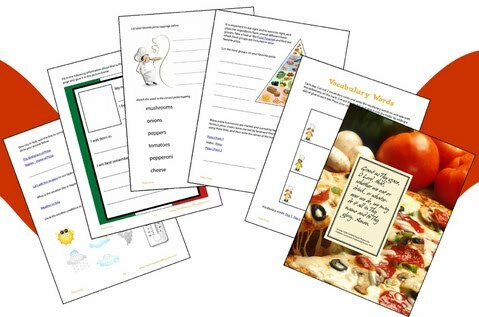 Topics are listed by age levels - each level has a wide variety of topics - covering the different types of writing - informative, narrative and persuasive. The student can opt to go through the tutorial before the pre-writing process or start writing immediately. The student types in their draft and then submits it for review. The program displays a graph - showing the student's progress and what they need to work on. My Revision plan is displayed and the student is lead step by step through the revision process. Optional are tutorials that help the student understand the need for revisions and what they might have left out of their essay. Drop down menus help the student revise his draft until it is polished into a product that meets the rubric requirements. My oldest got very frustrated when we got to the actual writing part. This was harder to navigate and even though he could click on things for explanations he did not understand what the program was trying to tell him. He is dyslexic and any reading is difficult for him. The writing area doesn't operate the same as a word processing program and if he tabbed instead of using the indent button all of his work vanished. Unfortunately he refused to finish and the battle was not worth it. We also had some intermittent connection issues that added to his frustration. I do believe this was our cable modem and NOT My Access!. My son, however, associated it with the program and I was unable to persuade him to use it further. I experimented with the program myself in order to give a fair review of the product. The problems my son had are not typical of most learners - my son has dyslexia as well as autism and this makes both the process and the act of writing very difficult for him. The problems he had have nothing to do with the actual product. I would highly recommend this product for a student who needs help polishing their writing into a finished product. It is well put together and easy to use. I believe it is well worth the price and if I had differently abled learners it would be on my must have list. To see what others on the TOS Crew have to say about this product click here.